28 August 2008 – 4:00 P.M. This is to notify the public and concerned authorities on the ongoing seismic unrest at Taal Volcano. Surface thermal observations however, did not indicate significant change in the thermal and steam manifestations of the Main Crater Lake area. 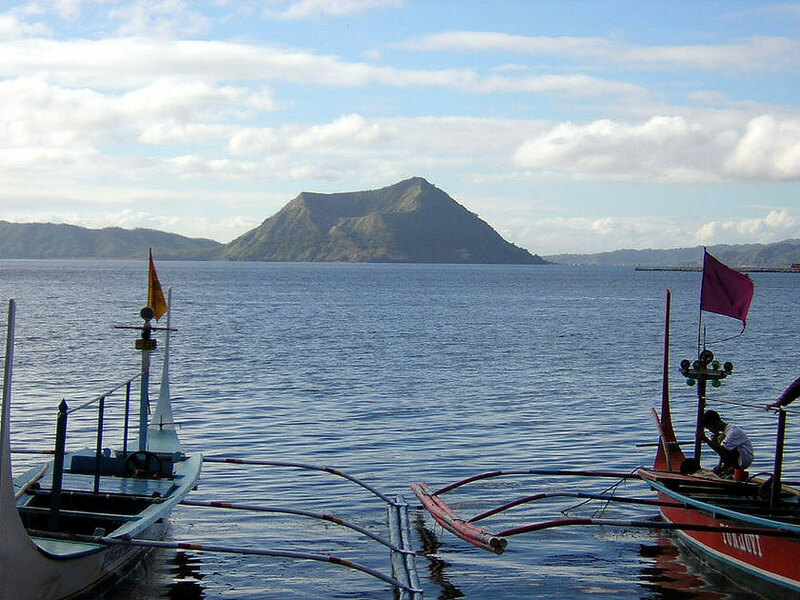 The increase in seismicity at Taal Volcano reflects a low-level episode of unrest. Alert Level 1 remains in effect over Taal Volcano. At present, no imminent eruption is indicated although the public is advised to observe some precautions. In this regard, PHIVOLCS reminds the general public that the Main Crater area is off-limits because steam explosions may suddenly occur. Other hazards within the Main Crater may be the build up of toxic gases in case of more pronounced volcanic reactivation. The northern portion of the Main Crater rim, in the vicinity of Daang Kastila Trail, may also be hazardous, when reactivated with steam emission and increased thermal activity. Furthermore, the public is reminded that Taal Volcano Island is a high-risk area and permanent danger zone, hence, habitation is strictly not recommended. Philippines Taal Volcano Could Erupt Anytime! August 10, 2008 – 12:00 P.M.
At 9:12 A.M. today, Mayon Volcano manifested mild ash explosion that reached an approximate height of 200 m above the summit crater before drifting east-northeast. The ash-ejection was recorded as explosion-type earthquake which lasted for one minute by the seismic network deployed around the volcano.Immediately after the explosion, visual observation becomes hampered by the thick clouds. During the past weeks, seismic activity had slightly increased and crater glow had slightly intensified. Precise leveling surveys conducted at Mayon from May 10 – 22, 2008 compared to February 17 – March 2, 2008 survey also showed inflation of the volcanic edifice. The above observations show that Mayon Volcano is undergoing an episode of increased activity probably related to magma movement and post eruptive behavior of the volcano. Although no major eruption is indicated, steam and ash explosions may occur in the following days. In view of the above, PHIVOLCS reiterates that Mayon Volcano’s status remains at Alert Level 1. The public, however, is reminded that the 7-km Extended Danger Zone (EDZ) at the southeastern flank of the volcano and the 6-km radius Permanent Danger Zone (PDZ) at other areas remain off-limits due to the continuing threat from sudden small explosions and rockfalls from the upper slopes. Active river channels and those areas perennially identified as lahar-prone around the volcano should be avoided when there is heavy and prolonged rainfall. PHIVOLCS is keeping a tight watch over Mayon and shall immediately report any significant development to all concerned. This entry was posted on August 31, 2008 at 3:48 am	and is filed under Climate Change, energy, environment, food, Global Warming, health, natural disasters. Tagged: Alert Level 1, Daang Kastila Trail, Mayon Volcano, New system for volcanoes, Philippines volcanoes, PHIVOLCS, Seismology, steam explosions, Taal Volcano, volcanic ash, volcanic gases, Volcano Watch, Volcanology. You can follow any responses to this entry through the RSS 2.0 feed. You can leave a response, or trackback from your own site.